The creator who brought Robbie Reyes, the All-New Ghost Rider, back to life for Marvel is back with another high-octane adventure with his Kickstarter passion project, Death Metal Zombie Cop. If the title alone doesn't grab you then check out the amazing art. "All pledged funds will go towards DEATH METAL ZOMBIE COP #1 production costs and backer rewards! If this campaign is successful you will have helped me fully realize the first issue of an ongoing series I can own as a creator! I'm hoping this campaign will generate enough reader interest to allow me to continue this story which I've already written 2 story arcs for. 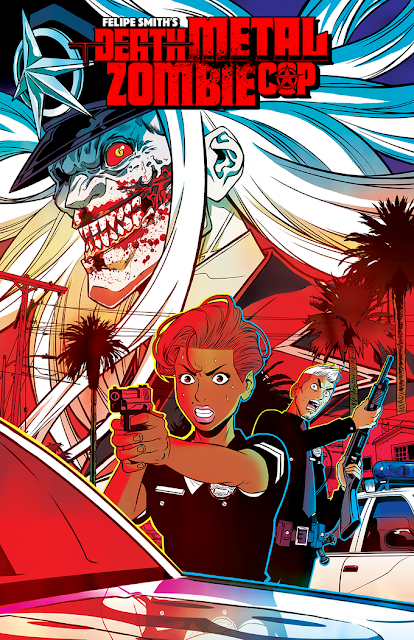 If you've enjoyed my prior work (MBQ, PEEPO CHOO, ALL-NEW GHOST RIDER, GHOST RACERS) I hope you give DEATH METAL ZOMBIE COP a shot by pledging! You will only be charged if I reach my funding goal, and if that happens, you're in for a SAVAGE TREAT! Let's make it HAPPEN!" CLICK HERE TO GO THE KICKSTARTER PAGE AND PLEDGE NOW!